While Joan might have gained notoriety for the mad Pepsi Product Placement in her films during and after her marriage to Pepsi president Alfred Steele ('55 - '59), she had actually already been hawking everything from makeup to shoes to beer (as well as Coca-Cola and RC) since 1927, two years after her arrival in Hollywood. She continued endorsing a wide variety of products until 1973, four years before her death. 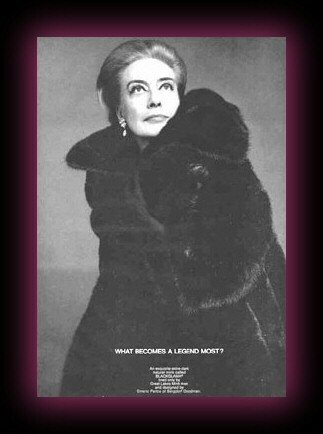 Below are thumbnails of print ads featuring Joan, grouped by decade. Click on a thumbnail to see a larger picture of the ad. Click here to go directly to the bottom of this page for an alphabetical list of companies she endorsed in print over a 46-year timespan. Joan's print ads solely promoting her movies can be found on each page for the individual film. Info on her TV ads is on the Joan's TV Commercials page. If you have any additional information on companies she endorsed, or have a photo I can add here, please e-mail me. Thumbnails are arranged chronologically. Click on a thumbnail to see larger picture.